I would like President Obama to release or threaten to release a portion of the strategic petroleum reserve to scare some of the speculators out of the petroleum futures market. If they lose their confidence that prices have nowhere to go but up, they may be more cautious in the future. And that will force the price of gas down. As I wrote in a previous post Gas prices, the long-term solution, beside green energy, is more competition among the oil companies which now form a cartel. 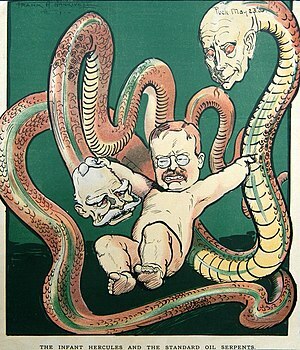 Teddy Roosevelt tried to bust the oil cartel in 1911 by breaking Standard Oil into several smaller companies. However, that victory was largely ineffective because the several parts of Standard Oil continued to collude with one another, and even maintained their main offices in the same building for a time. Breaking up the oil giants will be difficult, but it is a mandatory goal for Barack’s second term. In the short-term, we can get relief from high gas prices if our government regulators police the speculators more closely and if prohibitive taxes are instituted on speculation. Additionally, some refined gas is being shipped abroad at a time when US demand is down. I would like to see a temporary ban on gasoline export whenever prices at the pump reach or exceed a certain level. Finally, I suggest that you consider writing to the White House to express your thoughts on this matter and/or anything else you feel strongly about. Please express your thoughts in your own words; they will have more impact than repeating someone else’s words. The White House link is http://www.whitehouse.gov/contact and the form to fill in is found about 2/3 of the way down the right side of the page entitled “Submit Comments Online ” I recommend also that you send a copy of your comments to Rachel Maddow of MSNBC at rachel@msnbc.com She is fighting for us, and she is more effective than most at calling a spade a spade.